Ytterbium fluoride, YbF3, is a low-index film material that exhibits good transparency from the UV through far-infrared regions. The films are insoluble and show low stress, making YbF3 a useful substitute for ThF4 in many IR applications. It can be combined in multi-layers with higher-index ZnS, ZnSe and Ge layers and with other fluoride compounds. Typical applications are in AR, long-wave pass, short-wave pass, and filter coatings in the 3 to 11μm wavelength range. A particular advantage that Ytterbium fluoride coatings provide is the minimum appearance of water absorption bands in the Mid-IR region. Thicknesses greater than 2 μm will be dense and will adhere to Zinc sulfide, Zinc selenide, glass, and Germanium substrates that are heated to 200°C and higher temperature. High film stress at thicknesses approaching 2 μm on Ge substrates results in scatter due to micro-cracking. An adhesion- assisting layer consisting of ~50 to 150 Å of an oxide such as HfO2, Y2O3, or Al2O3 often assists adhesion and stress reduction. Ytterbium fluoride is insoluble, therefore making it suitable for operation in humid environments when applied on hot substrates. 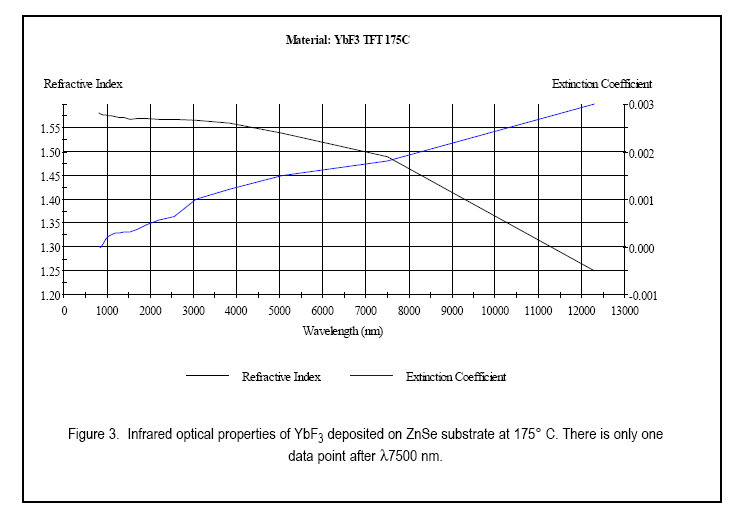 The water absorption bands at 2.8- 3.2 μm and 5.6 -7.3 μm that typically appear in other fluorides (YF3, for example) are less deep in Ytterbium fluoride films; and are further reduced at substrate temperatures near 200° C. When used in multi-layer combination with ZnS or ZnSe film layers, the substrate temperature must be reduced to ~160° C to avoid the lowering the sticking coefficients (condensation rate) of those materials. 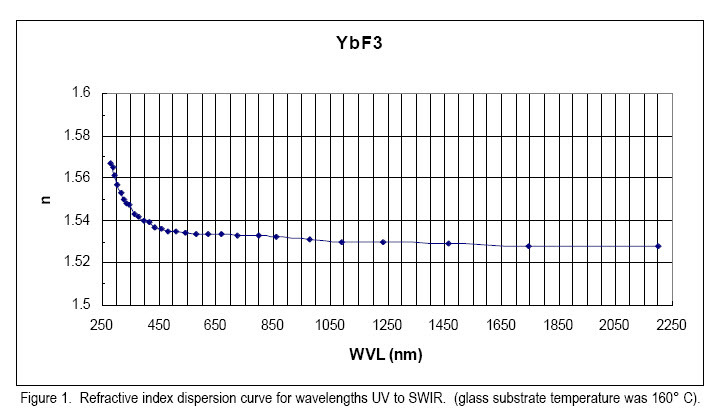 The refractive index characteristics of YF3 films are shown in Figures 1 and 2 for near-UV to short-wave IR wavelengths. The properties at longer IR wavelengths are shown in Figure 3. Because of their small water absorptions compared to other fluoride compounds, Ytterbium fluoride films find excellent application for coatings from the visible wavelengths to ~ 7 μm. The material melts without outgassing or particulate ejection from either a boat source or an E-beam crucible. A constant evaporation rate of >10 Å/s can be maintained. 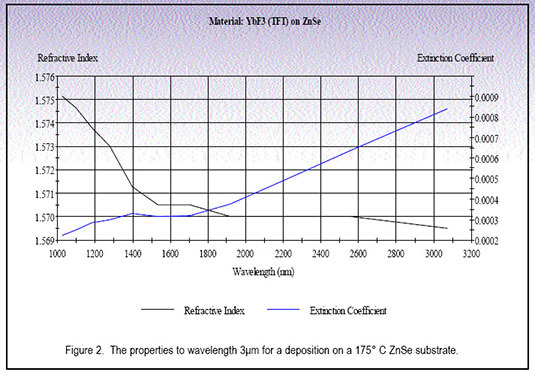 Ytterbium fluoride films can be deposited from a melted charge using resistance-heated or electron-beam evaporation. Low Ebeam power is recommended to avoid dissociation. Film density and refractive index increase with substrate temperature. Melting and evaporation proceed smoothly with no outgassing, spitting or pressure bursts. By E-beam: Melt material with a low power sweep until spitting and outgassing subside as an evaporation rate of 1Å/sec is approached (~15 min). Increase the power gradually to form a uniform melt before opening the shutter. By resistance heating: Using a baffled box source that has a perforated top (similar to ThF4 procedure), fill and heat to gradually approach evaporation temperature.